With more than 18 months on the Australian market, most examples of the Mack MP10 have disappeared into the desert on road train duties and in mining roles. Matt Wood takes an MP10 Super-Liner for an interstate produce run to see what it’s like to live with over a couple of days. It’s been 18 months since the launch of the big banger Mack Super-Liner with a 16-litre MP10 engine and that’s when I last drove it. The Super-Liner I drove back then, as a double road train at 80 tonnes, felt more like a heavy B-double with all 685hp (504kW) under foot. It was only when driving the big brother Titan at 110 tonnes with a triple on that I felt all 685 gee gees were starting to do their thing. Myself, I couldn’t get that stupid grin off my face for a few hours after I hopped out. But, these big bad bits of gear are seldom seen on the east coast. That big bonnet and big GVM are designed for the wide open spaces of Australia’s interior not for carving their way down arterial freeways in capital cities. Or are they? Heavy haulage is an obvious area where the new big bulldogs shine, but as an intercapital highway runner either the Titan or the Super-Liner are usually too long to fit more than one trailer behind which is an obvious waste of all that torque and horsepower. But, in B-double bulk roles, such as tankers, tippers and livestock, where weight rather than volume are the priority and 26m in length isn’t an issue, the Super-Liner has a lot to offer. The MP8 powered Trident has been Mack’s 34-pallet B-double champion for a while now, but after spending quite a bit of time behind the wheel of the Trident, I’m not sold on the MP8’s performance as a heavy B-double hauler. As I’ve stated in the past the 13-litre 535hp (393.5kW) MP8 definitely has a crack at the title, but at gross weights more than 60 tonnes it does feel a bit … comfortable. I recently spent a couple of days behind the wheel of a new MP10 powered Super-Liner set at the entry level 600hp (441.3kW) rating and it was a good chance to reacquaint myself with the heavy spec bulldog. The difference this time around though, was I was going to be hauling a real load to the New South Wales central coast, out of Victoria and I was going to eat and sleep in the Super-Liner. On the downside, the engine wasn’t going to get much of a workout as I was only able to pull one trailer of produce this time round. The Mack MP10 Super-Liner’s 16-litre engine is controlled by a 12-speed mDrive AMT transmission. But it didn’t get much of a workout in this test. 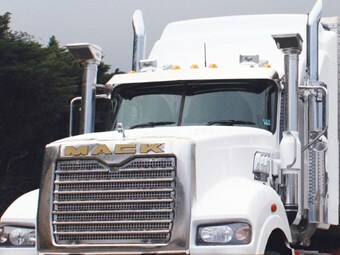 Driving a Mack requires some commitment on the part of a driver. It’s one of the few line-haul brands on the road today without an integrated sleeper cab; this may not have been so unusual in the 1980s and ’90s. But compared to the competition, all of the Mack heavy-duty models feel a bit cosy in the cockpit in line-haul guise. This is mainly due to the fact, regardless of sleeper size, they are still a day cab with a bunk attached. So if you happen to be a bit of a klutz like me, you’ll be forever tripping on the lip between the sleeper and cab floor or you’ll be forever clocking your head on the overhead console, that has been strategically placed in your way, when moving from the cab into the bunk. This particular truck had been specced with a B-double friendly 36-inch (91cm) high-rise sleeper, which was cosy enough and surprisingly well-appointed. Between the locker boxes and the under-bunk cab storage all of my bits and bobs had space. One big improvement is the gearbox selector pad has been moved to the top of the dash panel and laid out horizontally. Interestingly, if you cross your eyes slightly while looking at the gear pad it now looks as if it spells out the word: random. This is of course not true, but what this now means is if you’re using the transmission in manual mode you can now place your hand on the top of the dash and swap the cogs with your thumb. Previously you had to aim for the centre of the dash transmission pad with nothing to brace your hand on and if you were driving in an off-road situation it gave you all of the swaying accuracy of a drunk trying to use a cheeseburger as an ATM card at 3am. The Australian designed sleeper does have its advantages; for a start all of the lights and controls are on the high (right) side of the bunk. There are also plenty of power outlets for extra appliances and even a towel rail to save slinging a wet towel across the passenger seat. 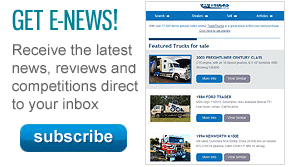 The Mack branded stereo unit is actually better than a lot that are standard fitment in prime movers these days. 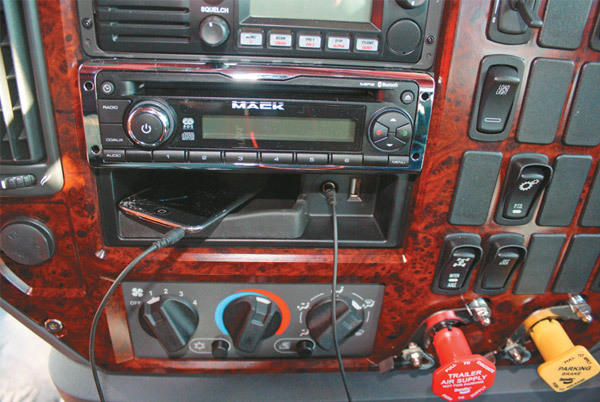 With Bluetooth and iPod connectivity you can rumble along to you own brand of tunes or use the CD player AM/FM radio for a bit more of an old school approach. Being an old metal head from way back, I occupied myself with ‘Wrong Side of Heaven’ the latest album from United States metal outfit Five Finger Death Punch. If anything was going to test out the four speakers in the Mack this was. I have to say that the whole set handled the vicious onslaught of noise very well. Under the head unit is a handy shelf that’s perfect for an iPod or phone, the shelf also features an auxiliary input and an iPod jack. The therapeutic effects of listening to loud heavy metal while driving cannot be under-estimated. For a start, to combat fatigue, you can pretend you are rowing a Viking long boat. 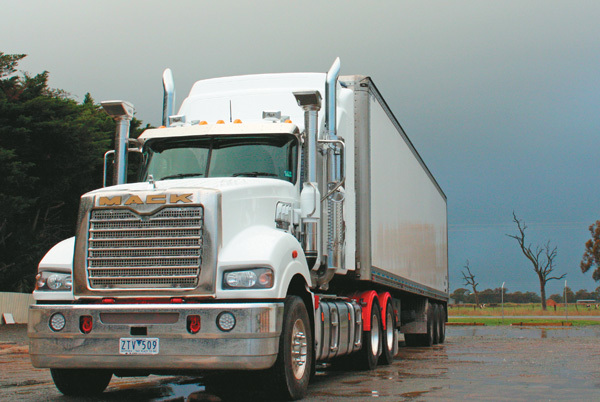 The set-back steer axle Super-Liner was on demo with Werribee South-based produce carriers Damorange Refrigerated Transport (DRT). 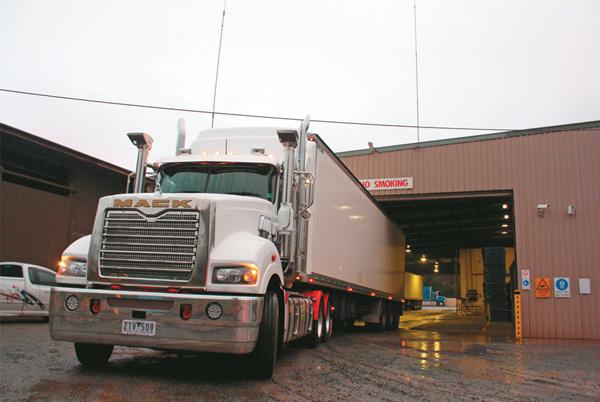 My job was to get a partly loaded trailer to Mooroopna in Victoria’s Goulburn Valley, throw on the rest of the load and head to the Woolworths distribution centre (DC) located at Wyong on the New South Wales central coast. So once fully fuelled, I loaded up my own kit and took off up the Hume towards Shepparton. Out on the open road the Super-Liner is in its element, the large lump of engine is quite low slung in the Mack mainly due to the flared chassis rails which allow the engine to sit between the rails. With bugger all weight on to start off with neither the 12-speed mDrive AMT nor the 600hp (441.3kW) engine was working hard at all. 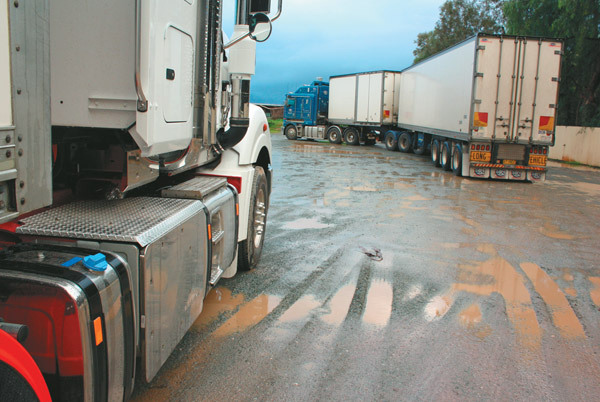 A short wait at DRT’s Mooroopna depot saw me loaded and on my way in no time, but as luck would have it, the heavens opened up and it started to bucket down. As I climbed ‘Revenue Hill’ just south of Glenrowan a couple of things occurred to me in quick succession. First, the way the truck was performing I was in serious danger of developing deep vein thrombosis (DVT) dueto my lack of activity behind the wheel, between the prodigious horsepower output, the cruise control and the descent control I didn’t have to touch a thing. Second though, I was concerned at the rapid descent of the fuel gauge needle and this had me wondering as the rain got heavier and heavier. Then it occurred to me, the fuel tank crossover taps must not have been turned on. I was using only one fuel tank. As the wind and rain lashed the side of the truck I was not looking forward to the prospect of crawling under the truck with a torch. I elected to pull into a road house and use the shelter of the bowsers to keep me out of the water. Unfortunately, there happened to be a river of water flowing down the driveway, and I found this out as it ran down my neck while underneath the prime mover. On the upside, I now had enough fuel to get to Wyong; the downside was I smelt like a wet fuel filter. I arrived at the Woolworths DC in good time and soon it was my turn to back onto a dock. For such a heavy spec vehicle the Mack proved quite manoeuvrable and visibility for a truck of this type was excellent. Backing around a corner in something like a T909 Kenworth often means leaning out an open driver’s door to see around the sleeper and the exhaust stacks. In the Super-Liner however, I managed to keep the dock in the mirrors at all times as I backed on in the dark. Even the turning circle was a surprise for this kind of truck. With my load of fennel, apples and pears now unloaded and my logbook out of hours, it was now time for me to hit the hay. While the 36-inch (91cm) slim-line sleeper may not have been generous room wise, it still proved quite comfortable and I slept like a log on the inner-spring mattress. Another nice touch was the wrap around curtains. Many bonneted prime movers miss out on this but it really helped to keep the daylight at bay. However, the curtains and the runners were very stiff and it was a big exercise to pull them out and put them away. The drive wasn’t a great challenge for the 16-litre MP10 and I deliberately held the transmission in overdrive as much as possible to make the big donk work. 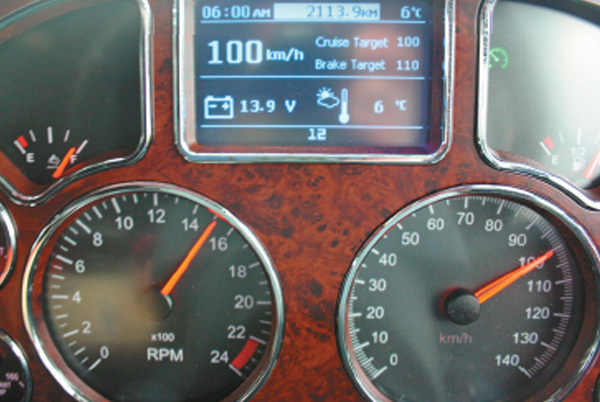 But with only 1,500km on the clock when I climbed behind the wheel it was always going to be a little doughy. It’s funny though, there’s something about the way Volvo-based engines work that can seem a bit slower and lazier than they really are. North American engines feel as if they are straining against the speed limiter and an up-hill drag will see a higher rpm attack on the grade. I’ve noticed the Volvo/Mack 16-litre engines seem to take a deep breath before knuckling down and working. Once working, the 2,065ft-lb (2,800Nm) plus of torque on tap kicks in then the vehicle chugs to the top of the grade without much fuss. Peak torque is from 1,000rpm to 1,500rpm. As it turns out my backload fell through so I ran home empty, not that being empty or loaded made much difference the MP10. 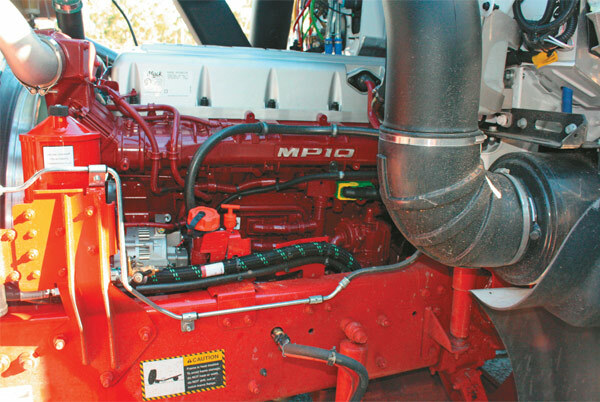 I’m a big fan of the MP10 as well as the Volvo D16 engine, that the MP10 engine is based on. In Volvo form the D16 propels the FH flagship, but my preference goes to the bulldog version. In the Mack you get the feedback from the road and enough engine noise to hear what’s going on without it becoming intrusive. The Powerleash engine brake didn’t have to work hard in my case but past experience has shown it to be very effective at holding back a loaded vehicle. The mDrive ’box swaps cogs smoothly and even with the slim-line bunk the truck was easy to live in for a couple of days. 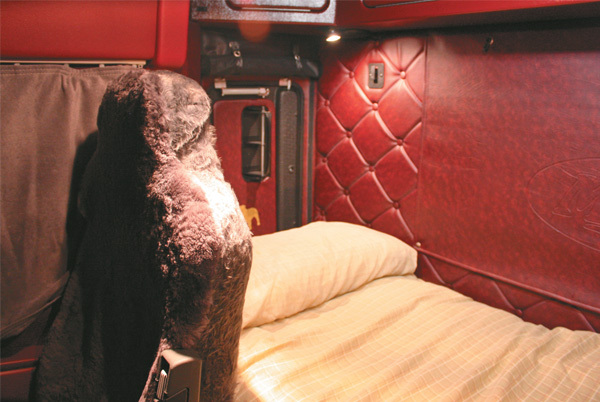 Mack just needs an integrated sleeper cab to take a good product to the next level. The Super-Liner is a great handling truck, and deals with the broken asphalt of a country road with ease. The use of selective catalytic reduction (SCR) to meet emissions standard means that the active regeneration afterburner found on many exhaust gas recirculation (EGR) engines is taken out of the picture. 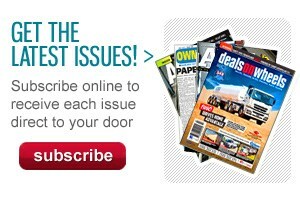 This is very handy if you happen to be carting a load of hay. For heavy applications from heavy haulage to tippers, tankers and livestock the MP10 Super-Liner ticks a lot of boxes, and it’s even comfortable, but in a good way.